Periostat (20 mgs doxycycline hyclate) has been helpful to some rosacea sufferers. Originally developed to combat periodontal disease (gum disease), periostat was approved by the FDA in 1998. Recently the FDA approved the introduction of generic periostat equivalents. Ivax Pharmaceuticals and CorePharma are now free to sell their generic equivalents of Periostat. Oracea is a new form of doxycycline, the same active ingredient as CollaGenex’s gum disease treatment Periostat. CollaGenex is shifting its focus to the dermatology market following the approval of generic competition for Periostat. Colin Stewart, CollaGenex’s president and chief executive officer of CollaGenex, said he believes the product could “significantly expand” the current $500 million market for prescription drugs to treat rosacea. Oracea is a new sustained release, once a day 40 mg tablet. 10mg of this 40mg is coated to delay the release of the doxycycline. As part of the latest Phase III study for Oracea, when compared to the placebo, erythema showed a trend towards improvement. In a second study, the reduction in erythema achieved statistical significance as erythema scores improved (again against placebo). CollaGenex is also developing a new once-daily version of Periostat, called Periostat MR, to protect it position in the dental market. Collagenex has restructured their sales team around the fact that Periostat is about to become a generic label. The company is also seeking to expand the label for the drug’s main ingredient to include its use in treating a variety of skin disorders including acne and rosacea. Additionally Oracea may also be targeted towards treating ocular rosacea as well. Oracea is promoted as safe and effective for long term use. It was reported that the average duration of Oracea therapy is 4 months, compared to an average of 2.5 months for other rosacea prescriptions. Collagenex are holding up to 6 patents relating to Oracea. These patents cover Oracea’s method of use, mechanism of action and pharmacokinetic profile (i.e. how it is absorbed and acts over time). Collagenex reports that Oracea is equally effective as 100mg of doxycycline. That particular press release is a culmination of a trial that we have reported previously – oracea plus metrogel, better than 100mg doxycycline plus metrogel ? and also a 2007 SkinMed paper; maximum effective dose of doxycycline is 40mg a day. See more about how Collagenex are promoting Oracea. 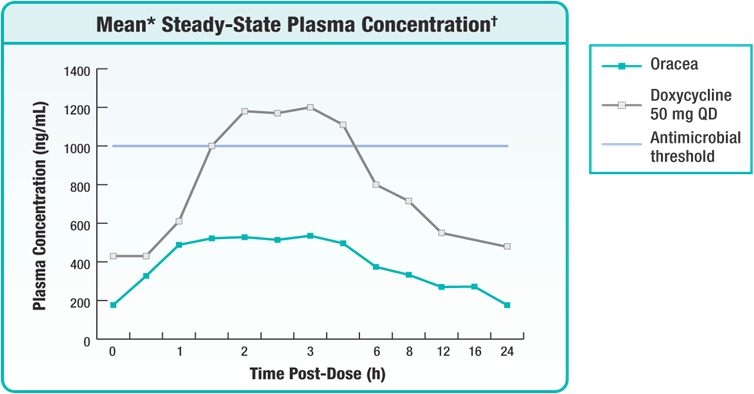 The following graph, sourced from Collagenex, shows the blood plasma concentration of doxycycline for Oracea compared to 50mg once a day of generic doxycycline. The horizontal axis stretches out to 24 hours post dosage. The vertical axis is in nano-grams per milli-litre (ng/mL). The anti-microbial threshold is listed here as a concentration of 1000 nano grams/mL (i.e. 1.0µg/mL). I read this graph to suggest that Oracea is able to maintain a sustained release of the active ingredient doxycycline without venturing into anti-microbial territory. The advantage of a delayed release product is that Oracea can offer the `area under the concentration-by-time curve’ delivery, but at sub-antimicrobial dosage over 24 hours. As part of Collagenex’ push to promote Oracea and Incyclinide, a new web site developing the idea that rosacea is a chronic inflammatory disease has been created. Be sure to check out the video of the the suggested Doxycycline Method of Action. As Oracea is a new prescription product it can be quite expensive, especially if you don’t have comprehensive insurance coverage. One possible alternative you could discuss with your doctor is 50mg a day of generic doxycycline. Whilst this dosage won’t have exactly the same profile in your blood, it is likely to be very close. As with all systemic treatments both, Oracea and a low dose of doxycycline can cause unwanted side effects so the supervision of your doctor is important. Galderma is now the owner of Oracea, having purchased Collagenex in 2008. Given that Oracea is really just doxycycline with a low dose and modified release mechanism, is it worth the extra expense compared to generic doxycycline low dose? Many are wondering if indeed Oracea is too expensive. Have you tried Oracea or another low-dose doxycycline ? How long did it take to see some benefit ? Did you experience any side effects ? Please leave a comment below. Comment via email from John. Thanks to everyone for their posts. I’ve had Rosacea for about 20 years. I have been taking Oracea for several years with great results. I’ve noticed a side effect though. I am getting moderate to severe pain in my upper stomach and back (a side effect acknowledged by the mfg.). I have stopped taking the Oracea, and I will call my doctor for a prescription of 50mg of Doxy. One thing I have not noticed anyone mention is Metrocream. I tried the gel, but it burned my face and didn’t help. The cream is gentler, and works very well on my face. I have had great success using Cetaphil (store brand – much cheaper) for cleansing and the Oracea along with Metrocream twice a day. Many great suggestions here. I will try the Aveeno oatmeal for my face. I take CoQ10 so I am considering stopping that to see if my flush goes away. Thanks, again, for all the great advice. Trixie I tried Oracea and it worked fine but was really expensive. Its nothing more than doxy in a time released formula. I did some experimenting and found that for ME I can actually take 50mg of doxy every other day and it works fine. Sometimes I can go as long as every 3 days. Metrogel does absolutely nothing for me. Even taking the doxy I would still occasionally get an outbreak on the right side of my face between my eye socket and sideburn. An area MAYBE 2 inches x 2inches. Turned red and itchy but it was fairly frequent and was driving me nuts for about 5yrs. Recently out of desperation I put some hydrocortisone on it just to relieve the itch and lo and behold the rash started to go away. I did this twice a day for about 3 days and its totally gone now. And it hasn’t flared up in months. I now only put it on once a day before bedtime–just a tiny bit because its a tiny spot. But it seems to work for me. As I’ve said on here before you have to find out what works for YOU. What works for me might not for you. I’ve experimented until I found the right dosages etc so thats what I suggest everyone do. And if you get desperate for the doxy always remember you CAN get it at the feed store for your animals (no seriously you can) and its the exact same stuff as the stuff for humans. No prescription needed. You just use the same amount they recommend for pigs. Again I’m TOTALLY serious about that. No kidding and no lie. Most animal meds have a formula on them that helps you determine how much of the med you give per weight of the animal. You are suppose to use the formula for pigs. ANYWAY good luck with what you are doing. I have had Rosacea on the sides of my nose. Large bumps and sore as well. I contracted Lyme disease and the doctor prescribed Doxycycline. I had no idea of its affect on Rosacea. After 1/2 month I kind of noticed that my skin looked unusually clear. That’s when I became aware of its use for Rosacea. When I went off of it after two months I had a bad recurrence. I was diagnosed with rosacea 20 years ago. I have been taking Oracea for over 5 years. If I don’t take it, I will get pustules and they hurt. I have had stomach pains since taking the Oracea. I use metrogel off and on, but I don’t think it really helps. This summer, I started using witch hazel on my face…what a difference! My face is not red and my pores are smaller. I have recently endured 3 IPL treatments to get rid of the red lines/veins from rosacea. Three days before and after the treatments, I was told to not take the Oracea. Pustules immediately formed. The treatments were painful, even with the cooling gel being applied before the treatments. 3 treatments cost $1080 and that was a ‘package’ deal (NOT covered by insurance; considered a cosmetic treatment). Because I am not happy with the results (none), I have been offered one free treatment. I am not doing it because if 3 treatments had no results, why go through additional pain. I am so disappointed and mad at myself for spending so much money and not getting results. I am a recently retired public school teacher and the treatments were a ‘gift’ to myself. I should have given that money to a charity. Many years ago, my dermatologist would ‘zap’ my red lines…it was not a laser, but I don’t remember what he used. Yes, it was also painful, but it worked; wish I knew what it was called. I DID get a wonderful sunscreen from the dermatologist and it is tinted. It feels so good on your skin; cool and smooth and light. It cost about $30, but I have been on the first tube for 2 months…it is called Elta MD Skincare/UV Physical/SPF 41/Sensitive Skin. I also changed from Cetaphil to Cerave for cleansing my skin and like the Cerave so much better. Staying away from Mexican food and alcoholic beverages is also key to controlling my redness. Good luck to all of you dealing with roasacea. Sharon I also use the Elta MD Skincare/UV Physical/SPF 41/Sensitive Skin as my daily sunscreen and love it. It is critical for those of us with rosacea to protect our skin from sunlight, particularly if we are also using Oracea/Apprilon. As I’ve said everyone is different. Do what I did and try the generic doxycycline. Way less expensive than Oracea and does the same thing, I get the 100mg pills so I can split them and after some experimentation I take 1/2 of one every other day and that seems to keep it in check. If I get a flare up I take 1/2 a day for about 5 days the back to every other day. Never had a stomach problem doing this. But it may take some experimentation on your part to find out what works for you. The only difference in Oracea and regular doxy is its proprietary and slow release. I’ve had just as good results with doxy after having used Oracea. Metrogel does zero for me. At 50mg it acts like an anti inflammatory instead of an antibiotic–and thats why you only take 50mg MAX per day. I also seldom get other colds, flu’s and other stuff that goes around but not sure if its due to the doxy or not. I also use a lot of sanitizer all the time especially in a store. My entire family had the flu and I was in the house with them for almost 2 weeks and never got it myself and I haven’t had a flu shot in more than 30yrs. Again not sure if its due to the doxy or not. At the very least you will save a pile of money using the generic doxy instead of the Oracea. Sharon as I’ve posted on here a few times I can tell you nobody is the same when it comes to Rosacea. Oracea is nothing more than expensive doxycycline. It works its just expensive. After doing LOTS of research I found that just regular doxy works just as well–for me. I did trial and error to find how often I should take it though normally the recommendation is 50mg a day. At that dose both regular doxy and Oracea act differently than the antibiotic they are. They act as an anti inflammatory. THAT is what Rosacea is. Inflammation. Gels and creams don’t work for me at all though some swear by them. Some say doxy doesn’t work for them or Oracea. Do what I did and get your MD to prescribe doxy and experiment a bit with the dose. Do NOT take more than 50mg a day as then it goes back to working as an antibiotic as I understand it. See what time of day works the best and how often. I am now doing 50mg every other day and that works for ME. I can’t say it will for you. I would also take it with food if it upsets your stomach though I usually have only heard that complaint from those that take Oracea. I am NOT a doctor, nor have I ever played one on tv, I am only telling you what works for me. My sister has it too and the metrogel works just fine for her. Just keep trying. You will find what works for you. But MY miracle drug is doxycycline. Oracea has been a godsend for my ocular rosacea. I struggled withit for years, told by every eye and other doctor I consulted that it was “just” blepheritis and that I needed to be more diligent about treatment with warm compresses, etc. I suffered with the redness, grittiness and sometimes outright pain for at least 10 years. About 4 years ago I self-diagnosed ocular rosacea, which was confirmed by a dermatologist. I then tried minocycline (no results), doxycycline 50 mg and Periostat. I’ve always had trouble taking some antibiotics due to their causing severe headaches. Unfortunately, even at such low doses, the immediate release doxy and Periostat caused headaches that didn’t go away, even though I stuck with each of them for 6 days. A year and a half ago the dermatologist gave me sone Oracea samples – my symptoms greatly diminished within a few days! Unfortunately my HMO did not cover Oracea, so I had to pay $420 for a month’s supply. I live on a fixed income, and that was way too much for me to pay. Taking it every other day didn’t work, so I would only take it when my eyes got really bad. My dermatologist was an angel, and gave me as many samples as she could. Just last week I decided to check the Medicare Part D Formulary – this year my HMO covers Oracea, though I had to get an exception. I just got 3 months’s supply for less than $100! I have also found that using Ocusoft cleansing pads has helped – Amazon seems to be the cheapest supplier. You can get a coupon valid for a year causing Oracea to be no more than $25 a month. I get one from my dermatologist every year and my pharmacist then keeps it on file. I am thinking now It is automatically no more than $25 a month w/o coupon. Sharon, Not sure if u will see this or not but when I used to have electrolysis done she would zap my broken vessels with her needle. Not sure if that is what your doctor used or not. Maybe search for someone that does electrolysis and ask them. I started taking Oracea last year and saw an immediate improvement in the pustules and bumps on my face. Then my prescription ran out last month… I was busy and my doctor wouldn’t renew it again without seeing me, so I figured that I would try going without to see if the bumps came back. Well, within less than a week, the bumps all around my nose and cheeks came back with a vengeance. I was able to get in to see my doctor last week, have been back on the Oracea for five days now, and my skin is almost completely clear again. It doesn’t help me with the redness, but make-up helps with that – at least the ugly bumps are almost gone again! Teri as I’ve said before everyone is different. I took Oracea and it worked but it is VERY expensive and its nothing more than time released doxycycline. If you want to save some money see if he will try you on plain doxy for a week or two maybe 3. I take 50mg every OTHER day but thats what works for ME. Even if you have to take 50mg every day its still way cheaper than Oracea. I get Oracea from ABC pharmacy in Rancho Cucamunga CA for $75.00. I had red bumps I thought were mild acne from 13-37. But dermatologists always prescribed minocycline which did nothing. At 37, I began the red bumps became more aggressive on my cheeks – the bumps were larger and appeared more frequently. My dr suggested I may have rosacea but it didn’t register – it didn’t look like the pics I had seen of rosacea sufferers with thickened scar-like tissue, red face and broken capillaries. So I waited – then over the next 12 months I developed a red scaly plaque on my chin and around my nose and lower cheeks. I went back to the deem and was given finacea gel. I used it religiously and it helped stop the plaques from getting worse but they weren’t getting better either And I missed having a smooth chin. Then it turned for the worse – the red bumps started growing around my left eye and I freaked. Did more research online and learned about perioral dermatitis – a cousin of rosacea. Might be the same thing even, only it presents as “muzzle rash” with the worst appearing around the chin, mouth and nose. But I also had the ocular bumps and was going crazy with ocular itching and dryness. So I switched dermis and received a diagnose of POD w/ crossover rosacea. She gave me oracea in september ’12 and I’ve been in it for 5 months. It’s fantastic! 95% of the problem went away within 2 weeks – and all of the scaly plaques are gone. I have a nice smooth chin, no pinkness and thank god even my eyes cleared up too! I do get some breakthrough red bumps that like to appear on my cheeks but I can handle those now. I’m also using finacea gel in the morning and metronidazole cream at night. I love finacea because it’s also an anti-ager and is gentler than the retinoids. Not so sure the metro cream is effective but it seems to have a little calming influence. I’m afraid to go off the oracea – very worries my skin trouble will return. Oracea was a miracle for me for the first eight months then everything changed. My rosacea I the worst ever ( bumps and mall pustules on each side of my nose). I continue using Oracea but not sure it works now. The package insert says thevstudiesvdo not cover use greater than four months. Pam it has been my experience that everyone is different as far as how to treat Rosacea. I used Oracea for a few months when I found out about it then did some more research and found out that plain old doxycycline works just as well and is far cheaper than Oracea. Oracea is just time released doxy. But that is what works for ME. I have been taking doxy now uninterrupted for about 5yrs or more. By doing some experimenting I have found that I only need to take 50mg every OTHER day to keep it under control–but again that is for ME. The 50mg dose is what they recommend for rosacea as it won’t act like an anti biotic at that dose it acts like an anti inflammatory which is what rosacea is. But I had to experiment for a few weeks to come to the dose I take. I do get a small flare up every now and then just above my right cheek but I take 50mg EVERY day for a few days and its controlled again–but again that is ME. You might ask your doctor to try you on doxy and see if that works and experiment a bit with it. I would only do at the max 50mg a day as that is what is recommended. For a while I even went to 50mg every THREE days and it works–sometimes. Don’t get discouraged. Keep trying until you find out what’s right for YOU. There is no cure–yet but there are ways to control it. Some people use Metrogel and some other things but gels and creams have ZERO effect on MY rosacea. Good luck and don’t give up. Victoria I’m glad you found something that works. But if you want a cheaper alternative just get your dr to prescribe plain old doxycycline. Thats all Oracea is except its time released. What I did was trial and error so it might not work for you. Everyone is different when it comes to rosacea. I started with one half of a 100mg pill a day before bed. I did that for a couple of weeks and saw very good results in about 3 days. After that it just got better until in about 2weeks the redness and bumps were completely gone. Then I started reducing the dose to see what I would tolerate. Eventually I ended up with taking only 1/2 of a 100mg pill every other day and that keeps my face completely clear. Creams have ZERO effect on ME but others swear by them. I’ve found in the past 10yrs that everyone has different tolerances so you have to experiment. SO what works for ME might not work for you. IF you try what I did 1/2 of a 100mg PILL–(make sure its a pill and not a capsule)–every day until your face clears up then you can start reducing the dosage until you find out whats right for you. My research on line I found that at that dose doxy and Oracea (which is 50mg of doxy and a time release formula added) works like an anti inflammatory and not an antibiotic. Once you get above about 50mg it starts working like it was designed which is an antibiotic. I cant’ emphasis this enough. EVERYONE is a bit different when it comes to this disease. My sister has it too but the creams work great for her. If you are of eastern european or Scottish or Irish descent you are more likely to get it than others too. But if you are happy with Oreacea who am I say to NOT use it. I’m just letting you know what I’ve found out over the years. Good luck. I tried it for a few months. Saw no improvement. I believe it also increased my photosensitivity so I stopped taking it. My face broke out for a couple weeks after I stopped taking it but has stabilized now. Is anyone worried it’s not good to stay on an anti-inflammatory for a long time? My internist thought it wasn’t good for me and my dermatologist says it’s fine. I’m a little worried it may hurt my kidneys in the long run if I take it for the rest of my life. I am 54 and just realized I had rosacea after having what I thought was adult acne for a year. The Oracea seems to have worked well with metrogel and my doctor just also gave me Vitamin C Restructuring Serum by Colette et Moi and now Nicazel (some sort of vitamin as I understand it) and Triple Therapeutix Rx pads for cleaning my face (those I love)- I think they have similar ingredients to the Citrix pads (I noticed when I searched under the ingredient list online). She also has me using Auriderm (the pads and the Auriderm make my face feel so cool and refreshed). Everyone says my face looks much better now- seems like a lot of stuff for a person who never took anything until now! As I stated before everyone is different. So what might work for me might not work for you. I find that 50mg of doxy every day or every other day is perfect for me. Metrogel does NOTHING for me. But it took me a while to figure out what did work. Two different docs have told me at the 50mg dose it won’t hurt anything as it acts like a mild anti inflamatory rather than an antibiotic. I’ve been doing doxy now almost 9yrs with zero problems. Mostly I do 50mg every other day but sometimes I get a small flare up and will take 50mg every day for several days to get it back under control. This took some experimenting to figure out so it wasn’t something the doc told me to do but he is fine with it now. I actually get 100mg pills and cut them in half as its cheaper–only slightly as doxy is pretty cheap to begin with. There are a couple of name brands of slow release doxy (Oracea) but they are REALLY expensive–though they do work. Keep experimenting to see what works for YOU but I really wouldn’t worry about bad effects of the doxy if thats what you take. Was it your derm that suggested the face care products you are using? I have rhinophyma and curious to try Oracea but don’t want to be on it longterm, not convinced there are no long term side effects. Patti, my dermatologist told me the same thing. I have been on Oracea since the first year it came out, more than five years and have not had any internal problems; get blood workup every year. I have tried to go off of it from time to time, but my face after about a week starts looking terrible and I also get sores in the roof of my mouth and have developed chalazions on my eyelids. I always go back on it. I did try the doxy but with my insurance it wasn’t much cheaper than oracea and I had more side effects with it. I always wonder the same thing as you, but since my kidneys, liver, etc. are fine after so many years, I am assuming it has had no effect. You are using the wrong cleanser! Anyone that has super sensitive skin or rosacea knows how difficult it can be to find a facial cleanser. Whoever invented the Green Tea Cleanser from Made from Earth —I thank God for you. I slather the Made from Earth Green Tea Cleanser on my face liberally—and i do not have the redness or ugly rosacea irritation I was getting. I take 100 mg of Doxy every night, use Klaron Lotion in morning and Metro gel at night and then use PanOxyl 10% to wash my face. The Doxy and PanOxyl have made a huge difference is my acne–pustules and I think the rest works well. I have Ocular Rosecea and my Optothomologist prescribed Restasis which has pretty much cured my crazy gritty dry itchy eyes. My eyes hurt so bad I could barely open them and this works but is expensive. Dr. told me to use all drops in little bottle until gone so not to waste them. At 40 now, my skin is getting much more sensitive and I started using pure honey after I wash my face and just massage it in then rinse and then aloe straight from the plant to ease discomfort. My skin feels much better after using these and less itchy and less acne is appearing. Now I need a good foundation makeup. In all the research I’ve done consistantly I’ve read that you should only use 50mg of doxy per day. Any higher and it acts like its supposed to which is an antibiotic. But at 50mg apparently it acts like an anti inflammatory which is what rosacea is. In fact there is one med that is time release that only uses the 50mg of doxy but its expensive which is why I use plain doxy. I forget the name of the other but thats how I got into doxy to begin with. My Dr gave me some samples of the name brand stuff and it was like a miracle but the expense was just too much even with insurance. I think doxy costs about $2 a month or so. I am not a Dr so I cant tell you what you should do however through trial and error I have determined that MOST of the time I can take 50mg every other day instead of every day. When I do get a bit of a flare up I will take it every day for about a week and it disappears. Doxy is a miracle for me but everyone is different so trial and error is the only way to go. Nothing works in one day so whatever you try give it a week to see if you have any luck. Hope this helps. I will say it again use doxycycline 50mg per day to get the rosacea under control then experiment a bit to see if you can go for a couple of days without it. I finally figured out that 50mg every OTHER day works for ME but might not for you. I get a 3 month supply for a couple of dollars using my Blue cross plan. Even without insurance I think its amost the same. It is very cheap and for me works great. Been taking it for about 10yrs now with zero side effects. The reason the other stuff is so expensive is its a name brand time release medication whereas plain doxy is not. Try it and good luck. I am 57 and was diagnosed with rosacea about 20 years ago. My dermatologist prescribed metrogel then and it did OK reducing the redness and pustules, but then it didn’t seem to work well after a number of years using it. He then switched me to a different topical, Desoximetasone USP, 0.25%. It worked better than the Metrogel had been doing of late, but about two years later, he wanted to wean me off of it, as it was a steroid (which he’d never noted to me when he first prescribed it). He put me back on Metrogel, but I had severe reactions to it–the redness was the worst I’d ever experienced and I had major pustule flareups, some of which caused permanent skin damage–the pustules changed to hard bumps that never went away along the cheek edges–when I’d never had any before but mild outbreaks of small ones that easily cleared up in the past. He then gave me a prescription for Oracea and had me apply Desox occasionally, to help clear postules Then, about 3 weeks ago, he gave me a small sample of Soolantrax to apply to any occasional pustules and it seems to work much better than any of the other topicals alongside the Oracea. The Oracea does seem to help a good deal, but if I miss one morning dose, or perhaps eat too soon after taking it, I find that the rosacea flares up again. However, what concerns me the most is that Oracea is an antibiotic and although my dermatologist never thought to warn me about possible side effects from use, I realized that daily intake (no matter what the company that produces it likes to lead you to believe) does adversely impact your gastrointestinal health. Thus, I made sure that I increased my intake of yogurt to counteract the killing off of good bacteria as well as bad, as well as taking at least one quality probiotic capsule per day. However, after nearly 4 months of taking Oracea, despite such precautions, I found myself experiencing of late pronounced pain in the upper stomach area and back, as well as gassiness and bloating. Also weight gain. So, in addition to the outrageous cost of Oracea if you don’t have a coupon deal, I am quite concerned about long-term use of this product. I’ve upped by probiotic intake, which has helped reduce the stomach and back pains, but worry that Oracea (or any other Doxy) will ultimately cause more serious health problems than the ones they are intended to relieve. I have been taking Oracea for a year or so with no problems. Now that I can no longer get it, my doctor prescribed DOXYCYCLINE HYCLATE 50MG. I started taking it, then I got sick (nausea, diarhiaa). I only took it for about 5 days. Do you think it was caused by the doxycycline? I thought since it is almost identical to the Oracea (except being 10mg stronger) it shouldn’t have bothered me. I have to get to PT for a recent knee replacement, so I cannot afford to get sick. Could I just have had some stomach bug? My face is in terrible shape right now, I don’t know what tot do. First off I’m NOT Dr I can only tell you what works for me. I started by taking Oracea but it was so expensive the Dr changed it to regular Doxycycline. I did some research prior to taking it including this site. I found that Doxy acts like an anti inflammatory at low doses of around 50mg. Otherwise its an antibiotic. Oracea is a timed release Doxy of roughly 40-50mg that you take once a day. I did some dosage experimentation and found that I can normally take about 50mg every other day though sometimes I do have to take it EVERY day. It has never upset my stomach and neither did Oracea when I took it. But it apparently has to be low dose of 50mg no more often than once a day. Some people are sensitive to any cycline drugs (doxy or tetracycline for example) so it could be that is what you experienced. I have tried the face cream (I forget the name) but it never did a thing for me. Generic doxy is pretty cheap too. And at least for ME it does work. I actually get the 100mg PILLS of Doxycycine Hyclate and cut them in half. (if I remember right it has to be doxycycline HYCLATE and not the other kind of doxy). Make sure if you ask for the doxy hyclate you specify PILLS and not capsules if you get the 100mg so that you can cut it. If you get the capsules you can’t cut them. And don’t go thinking that “Well if 50mg is good then 100mg is better” because it isn’t. Once you go over the 50mg threshold you are back making the drug into an antibiotic.And since rosacea is an INFLAMMATION that is what you are trying to treat and NOT an infection. Good luck. Keep experimenting you will find the right dosage. I’ve heard of some who can take it every 3 days but I have to do it every other day. Hi dean , can u check that graph in the article ? It says that 50 mg surpass the anti-microbial zone. I think the better option is 20 mg of doxy twice a day because i’m afraid of bacterial resistance. Sorry but I don’t see a graph anywhere. As it is the information I have about this is from about 12yrs ago when I started taking doxycycline. At that time every article I read said 50mg was the amount. Oracea is a specific name brand time released amount but its STILL basically doxy.Where they got the dosage I don’t know–maybe its because its time released. I know that for ME 50mg works and most of the time I only have to take it every OTHER day. That was after some trial and error including taking 50mg EVERY day to every 4th day. I finally settled on every other day most of the time though sometimes I have to revert to every day for a week because of an “outbreak”. My Dr keeps an eye on the dosage and HE says 50mg is correct so thats who I’m going to believe. He also says that 50mg is the correct dosage to NOT get anti biotic resistance. Whenever I answer on here I make sure to let people know I am talking about what works for ME and that it might NOT work for you. Doxy won’t hurt you unless you are allergic so my SUGGESTION is to experiment a bit and see what works for YOU. The biggest reason I went from Oracea to doxy is the cost. About $300+ for Oracea and about $10 for doxy and it does the same thing. Good luck. Hi all. I was diagnosed with rosacea this past summer. I started soolantra at night every night and 150 mg of doxy/day to get my flare under control. After about two weeks, my skin was completely clear. I attributed it to both drugs, since I started them at the same time, per my dermatologist’s recommendation. I wanted to get off the high dosage of doxy after 8 weeks because I know that you can develop a bacterial resistance if you stay on it for too long. I’ve been on the generic Oracea ($25 with insurance) for three weeks now and still do my soolantra at night. Couple of comments: my skin definitely is not as clear as it was when I was using the high dosage of doxy. It could be a coincidence but I now get a couple of rosacea “bumps” (small red bumps) a week. They flare for a day and then they simmer down, but they take a long time to completely go away. I’m really bummed because I thought I completely gotten my rosacea under control. I have my third v-beam appointment next week, and those have been working great to reduce the redness and small veins. Redness really isn’t my issue though, it is just the bumps. I will say that with the doxy and the rosacea I have NOT gotten any massive cysts or big postules. basically just small bumps. I’ve read a lot of amazing reviews about soolantra and oracea, and I’m wondering if it is possible that dropping from 150 mg of doxy to oracea caused an increase in the p and p.
First I am not a doctor so my comments are about what works for me after a bit of trial and error. Oracea is expensive but worked pretty well for me until I did some research–you should as well and not just blindly listen to me or anyone. I found that researchers say plain old doxycycline works well for MOST people though not all. Research shows the best dose of doxy is 50mg a day. At this dose it works as an anti inflammatory and NOT an antibiotic. And rosacea is an inflammation. So you are treating the inflamation with low dose doxy which, from all the research I’ve seen, means you dont build up a tolerance/immunity to it like you might using “regular” antibiotic dosages. My doctoe confirms this and I have now been on doxy continuously for 11yrs. No side effects and apparently no “resistance” to it or other antibiotics. Through trial and error I have found for ME (and I cant emphasize that enough) I can takd 50mg every OTHER day 90% of the time. Every now and then I get a little flare up and have to go back to using it every day for about 5-7 days. I think for me it seems to coincide with eating acidic foods. As far as I know there is NO cure for rosacea so I wouldnt get my hopes up and think you will someday be free of the flare ups. MY regimine works well for ME but my sister also has it and she uses strictly one of the creams and that works for HER but the creams I have tried have zero effect on mine. I would say if you can afford Oracea it works well but if not then doxy at 50mg a day is where to start. Its about $10 through my insurance for 30 days of 100mg pills. But since I only take 50mg a day I split them in half with a pill cutter–note I said pill and not capsule. This also extends that 1 month supply to 2 months. Try adjusting the dose to see how many days you can go using ONE 50mg dose. It took me several weeks of trial and error to get to the every other day dose. Dont get discouraged and good luck. Following many years I have used both and sadly with not much improvement. However “redness relief calmplex” by Skin Medica has helped with breakouts and redness almost immediately! That’s what works for me and my skin!